I have really been enjoying the monthly guild felting group. 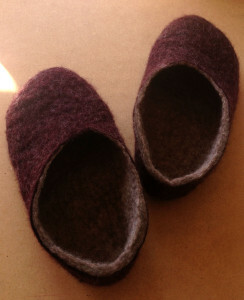 This month, we decided to make slippers. 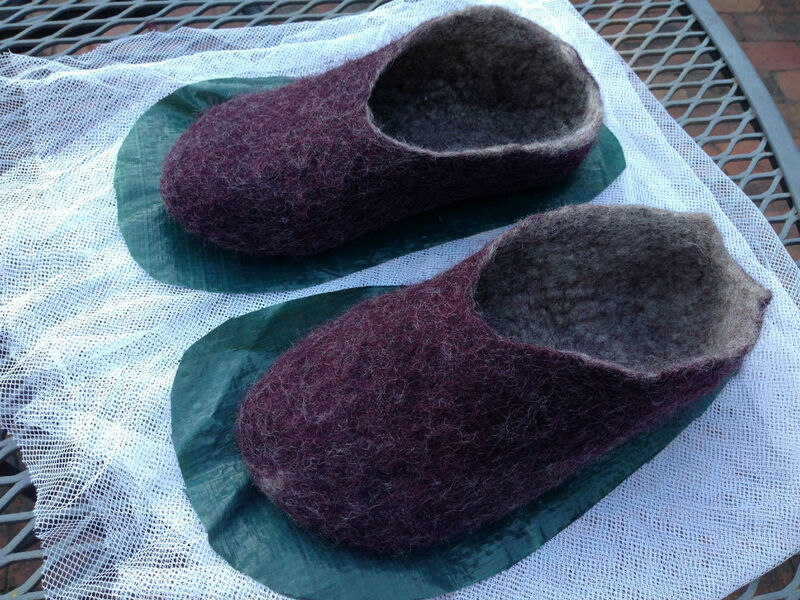 Good thing too, since my favorite wool Haflinger slippers gave up the ghost a while ago. I had the felt insert replaced but it was beyond hope when I wore through the toe. It had a good 20 year run. I should be happy. My replacement Acorn slippers, sadly, did not last nearly as long. Here’s what a couple of hours of work look like. The green plastic underneath is the form I worked from. The trick to removing the form is to cut a slit that is large enough to pull the form out, but not too big since the hole will enlarge as you continue the felting process. I should also add that you need to make the slit large enough to easily put your hand in and turn it inside out as you complete the felting process. That’s why there is such a funky dog ear at the heel because I had to cut again after fighting it for a while. 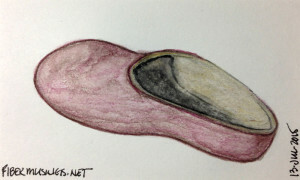 I did the final fulling with the slippers on my foot so there is a definite right and left slipper. I got a nice self foot massage in the process. Bonus! Here it is after I trimmed it once it is fully dried. As you can see, the edge where I trimmed was much fluffier than the edges that did not need trimming. This is because the edge was felted down and the body was less felted down. I want to weave a tape to cover up the cut edge to hide the inconsistent width. The finished slippers weigh less than 2 oz. Yes, less than 2 oz of wool. I plan to wear these at the loom this winter. I don’t want to worry about wearing through the sole so I will sew on a few pieces of leather on the bottom. Hopefully, the leather will add more weight to these slippers. Why? They are light enough each that Stormy thinks they are part of her toy collection and she carries them around. Each morning, I find them in a different part of the house than where I place them the night before. An ICAD based on one of the slippers.